Well, Paula, you should know something about me: I’m not a big talker. Especially not to strangers. I sort of have a live and let live mentality. But I’m trying to do better. I’m trying to be nice. The best conversation I had with a local was when one of the guys in the tow truck (pulling us out of the runaway truck ramp on Teton Pass) started talking to us and wanted to help Abra put on her shoes. Man, what a question. That will take a blog post to unpack. But the short version is this: find a new house, find some work, make a new life, and let the memories of this trip simmer on low for a few months. We have a 150 gallon fresh water tank that usually lasts for 3-4 days if we’re real careful. We can fill it at truck stops or rest stops or friendly gas stations. For power, we have a generator in the bottom of the bus. It uses diesel from the main tank, but not much as long as we don’t have the AC running (if we have to run the AC it uses about 1/10th of a tank during the night – ouch! – in which case we’re better off finding a campground where we can plug in to shore power). Dan, that’s just plain disgusting. But since you asked, I did unhook one time at a park where the waste pipe was much higher than usual, so when I unhooked and pulled the waste line under the bus, all of the contents still in the line ended up under the bus. But that was probably worse for the people who came after us than it was for me. Tough one. I can’t think of a single thing I would drop. Honestly. Everything has left such a huge impression on me. I would definitely include more time on the West Coast. Yellowstone was amazing. If I were planning the trip again, I’d try to make it for six months instead of four. We have not eaten out as much as we would have liked, due to budgetary constraints. But what comes to mind immediately is “Mother’s” in New Orleans. So many things. The Lodge Pole Pine (in Yellowstone) has a pine cone that is glued shut and only opened by fire. Our bus has a governor that will continue up-shifting even when you don’t want it to – which doesn’t sound interesting until it’s the reason your brakes go out 8400 feet up. No workers were killed while carving Mount Rushmore. Our older two, Cade and Lucy, loved New Orleans for the simple fact that it had their favorite children’s museum. Abra can’t stop talking about Lellowcone (Yellowstone) and Marshmallow (Mount Rushmore). Sam loved it as his Uncle Sam’s, where we got to play on twenty playgrounds at once. 10) What was your favorite natural landscape that you encountered on your trip and why? There were so many incredible sights. Northern New Mexico was amazing. Wyoming just outside of Yellowstone. A small stretch of canyon just west of Bighorn. Discovering that Yellowstone is actually a huge, active volcano, and seeing all the geysers, mud pots, and boiling springs (and wildlife). I really cannot say enough about Yellowstone. To be honest, Jon, I feel like this trip has been one big game of chicken between me and God. God keeps saying, “Do you trust me?” and I keep saying, “I trust you,” and then we get stuck in a ditch. “Do you trust me?” God asks. “I trust you,” I say, and then all of my potential work falls through. “Do you trust me?” God asks. “I trust you,” I say, and then we lose our brakes in the Teton Pass. “Do you trust me?” God asks. “I trust you,” I say (warily), and now we head for home with no home of our own to go to and no solid income lined up. 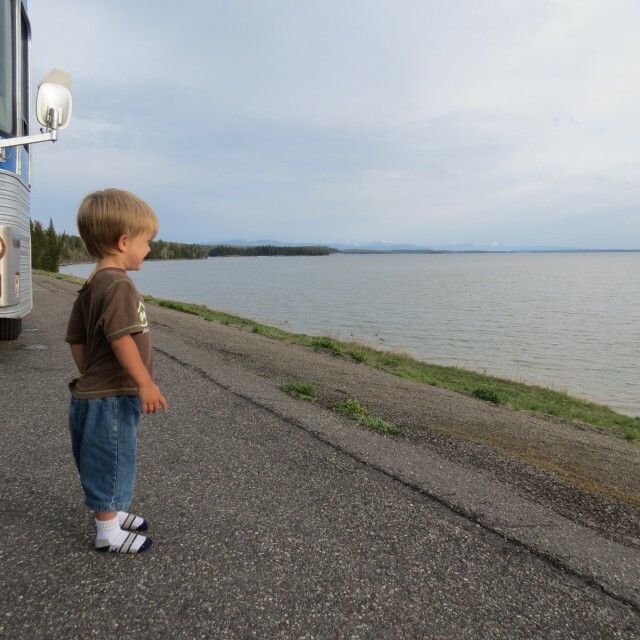 Mostly I feel a lot like Sammy looks staring out over a huge lake with snow-capped mountains in the distance: overwhelmed by the beauty of it all, not understanding much, and somehow knowing I am very, very blessed. Well, that’s only half of the questions, but I’ll get to the other half later in the week. In the mean time, here’s a question for you: If you took a trip like this, what would you be the most excited to see? My only regret is that I put off getting to read your blog for so long. I’m going to have to take some time and catch up. Great answers! Thanks so much for taking the time to take our questions. Safe journeys today. I don’t know if I could pick one place. My husband and I and our then 5 month old daughter took a 2 week driving trip “out west.” We traveled to Flaming Gorge, up North to Jackson Hole/Grand Tetons, then we spent 5 days in Yellowstone, and headed back East and stopped at Mount Rushmore, Windy Cave, and Devil’s Tower. I could do that trip again – especially back to Yellowstone. Absolutely loved Yellowstone. Places I still want to see? The Hoover Dam, The Grand Canyon, Yosemite, the Sequoia/Redwood trees, Carlsbad Caverns, Mammoth Cave…the list could go on and on. My husband and I have travelled to Hawaii and Alaska, so I figured that since we hit the 2 “hardest” states to see, I want to shoot for being in all 50. I’m at 33, I think. Attainable goal, I think. If I take a trip like this… no no… WHEN I take a trip like this, I would be most excited about traveling the west coast. From New Mexico through California all the way up to Washington then over to Montana. I can’t wait to see that part of the US. So true. Honesty and everything reedznigco. We are planning a trip next week to Yellowstone. So glad to hear all of the good reviews. Even after traveling all over the country, you still like Yellowstone. I have a feeling you’ll need to let this trip simmer on low for quite a few months (or years!) before you fully understand its impact on you and your family. Love it! I’d be most excited to explore the west coast and hit up various natural wonders. Yellowstone is definitely on my list. Enjoyed this trip within the trip! When you guys get back into Lancaster, I’d love to meet for breakfast or coffee!